Get RockMyRun – It’s Scientifically Proven to Improve Motivation During A Run! Looking to improve your workouts? Download the RockMyRun app! In fact, a recent study showed that RockMyRun improves motivation during a run, when compared to running with a playlist or with no music at all. In general, there is a plethora of scientifically proven physical benefits of exercising to music that is synchronous to your body. For example, it can increase your time to exhaustion by up to 20% longer than normal, decrease your oxygen needs by 7% and help you cover more than 2% more distance in the same amount of time1. In fact, these statistics are part of what drove RockMyRun to become what it is today and develop what we call Body Driven Music—or music mixes created by professional DJ’s and that have the ability to sync to your body. And while these numbers were all well and good, we wanted to see specifically what RockMyRun could do when compared to what many non-RunRockers do: Listen to a playlist or no music at all. So we teamed up with the scientists at EPARC, the exercise physiology laboratory at University of California, San Diego (UCSD) to do a study comparing the effect of RockMyRun on running motivation and enjoyment. Specifically, we wanted to investigate any differences between running sans music, with a playlist and with RockMyRun Body Driven Music. The results are in, and guess what we found out? Simply put, RockMyRun rocks! Using RockMyRun was proven with statistical significance to improve Intrinsic Motivation and enjoyment during running by up to 35%. Considering mustering up the motivation to exercise and keep at it can sometimes be the hardest part, we think this is pretty rad! Further, it turns out that when using a DJ-engineered mix of motivational songs at a constant tempo, participants had increased feelings of vigor as compared to standard playlists. Essentially, RockMyRun helped participants feel physically stronger and in better health during a run. Additionally, when looking at performance there was a really interesting finding: When people were told to run at a comfortable pace (as opposed to meet a certain goal), with RockMyRun they ran nearly 3% faster than with a playlist. So even though they weren’t trying to run faster, they instinctively, automatically did. So, are you ready to feel stronger, more motivated and perform better (even without trying!) during your next run or workout? 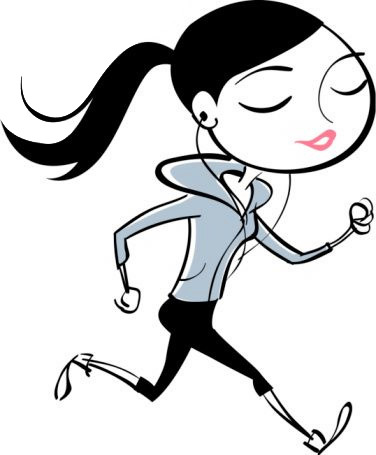 Download the RockMyRun app and get going! “Effects of synchronous music on treadmill running among elite triathletes.” Journal of Science and Medicine in Sport, 15, 52-57.